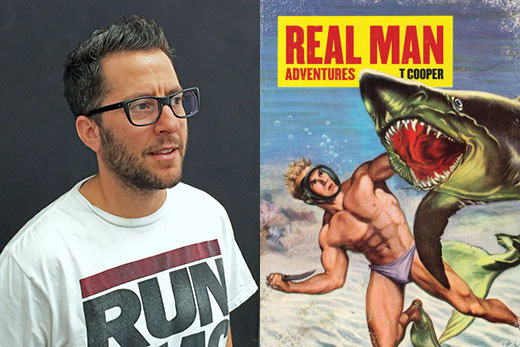 T Cooper, author of eight books including “The Beaufort Diaries,” “Lipshitz 6 or Two Angry Blondes” and “Real Man Adventures,” will join Emory’s Creative Writing Program faculty in the fall. T Cooper, author of eight novels including the bestselling “The Beaufort Diaries”and “Lipshitz 6 or Two Angry Blondes,” will join Emory’s Creative Writing Program in the fall. His ninth book, the fourth in the “Changers” young adult series he co-wrote with his wife, journalist and author Allison Clock-Cooper, will be published in September. Cooper, who will be an assistant professor of English and creative writing, first spent time at Emory as a visiting lecturer in the 2014-2015 academic year. Cooper earned his MFA in fiction from Columbia University. He published his first novel, “Some of the Parts,” in 2002, followed by “Lipshitz 6 or Two Angry Blondes” in 2006. “That second book is when I really started thinking in a more expansive way about the kind of storytelling I wanted to start doing,” Cooper says. His later work spans genres from music to performance art to film, often in collaboration with other artists. “As the forms and media of our storytelling change, having T Cooper here will be an extraordinary opportunity for creative writing students to learn from a working writer who is seizing creative opportunities wherever he can find them,” says Benjamin Reiss, professor and chair of Emory’s Department of English. Cooper’s third novel, “The Beaufort Diaries,” is a graphic novella about a polar bear forced from his shrinking native habitat into the wilds of Hollywood. “I found an extremely talented visual artist to help create the imagery with me that would convey the larger environmental story I was trying to tell,” says Cooper. He adapted the book into an animated short film which premiered at festivals including Tribeca and South by Southwest. “That was the first taste I really had of the independent film festival circuit, which definitely prepared me for the film festival run that I've just recently started with ‘Man Made,’” he explains. “Man Made” is Cooper’s first feature-length project, a documentary he directed, produced, filmed and co-wrote. The film goes behind the scenes of a transgender body-building competition and has been playing the film festival circuit. It won Best Documentary at the 2018 Atlanta Film Festival. “I love how storytelling begins to take on new life — and lives — when it comes off the page,” he says. For the next generation of writers, creative writing is about more than just talent — it’s about recognizing the best outlet through which to showcase your work. That’s why, in addition to honing students’ writing skills, Cooper is also developing a teleplay-writing class to teach at Emory. His goal is to bring to the classroom insights and skills from the front lines of not just the publishing world, but the film and television landscape, where more and more opportunities are presenting themselves, especially in the Atlanta region. Like many others over the last few decades, he has been excited by the level of storytelling being achieved not only on cable television but in episodic storytelling in general. “What is an excellent 10-episode season of your favorite television show, if not a novel come to life?” says Cooper, who has written for the series “The Get Down” on Netflix and “Copper” on BBC America and is currently adapting his YA novel series “Changers” for television. As people learn, consume and create media in different ways, Cooper suspects that the kinds of professional moves he has made into wider circles and genres of storytelling will become the norm for future writers and artists.